Crispy oven fried chipotle chicken tenders was on the menu tonight as part of our iftari. Easy, delicious, and healthy… oh, and they are baked [not fried]. Just the way I like it! Using boneless chicken cubes, or take chicken breast fillets and cut into chunks, I marinated it with: salt, black pepper, garlic powder, paprika, cayenne pepper, chili powder, chipotle chili powder, oregano, onion powder and a little milk [preferable buttermilk I suppose, but I used 1% today] to keep it moist and help the breadcrumbs stick. This helped lead to the no oil or no egg in the recipe. 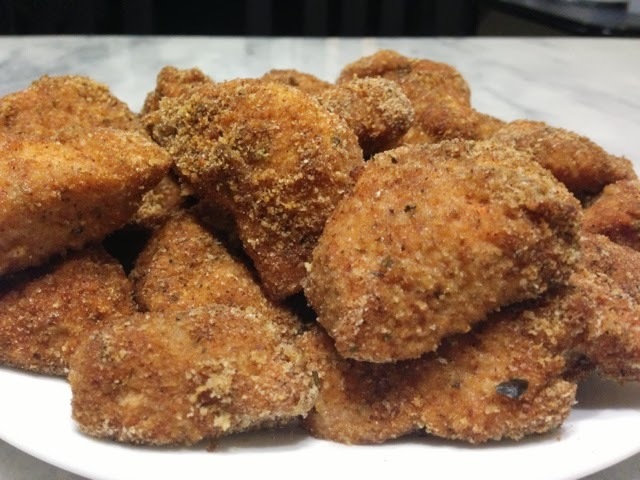 Next, season your [Italian seasoned] breadcrumbs with chipotle chili powder. Coat each chicken with the breadcrumb mixture before laying them on a lined baking tray. Spray non-stick cooking spray over all the chicken pieces. Bake in your preheated oven, for about 20 minutes. I let the chicken marinate for about two hours before I tossed them in the breadcrumbs… and even the marinade smelled amazing. The milk in the marinade? It definitely helped keep the chicken moist. After baking, the inside was moist and juicy – not tough or dry even after being baked. One of the huge negative aspects of baking chicken is how dry the end result can be a lot of times… but it doesn’t have to be bland, dry, or boring.